Justin is surrounded by Nesquick - a chocolate syrup product, being offered at this food bank. Is chocolate syrup really a food? How much sugar is in it? An extremely low in nutrients food with added, refined sugar. Eat too much of this and you'll die - in one sitting. We were pleased to be able to show Justin Trudeau and his family around our operations in Iqaluit today. We were able to discuss some of our challenges as well as highlight some of the great businesses and organizations whose support keep us open. 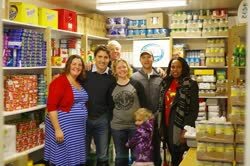 We were also incredibly grateful for the 9 large bins food donated by the Trudeau family. On behalf of our board, volunteers and clients, nakurmiik! Connie Karlsson I don't see any Inuk in this photo op??? Niqinik Nuatsivik Nunavut Food Bank This is a portion of our volunteer board of directors, who along with the rest of the board and over 60 volunteers ensure any Iqalummiut who come for food, get it. Last time we checked, hunger doesn't care about ethnicity. If you'd like to volunteer and help make a difference, please feel free.